The rise of the internet has greatly changed journalism over the last few decades, altering how newspapers deliver content and how journalists practice their profession. A new University of Kansas study shows that "digital disruption," or how journalism has changed in the internet era, affects newsroom employees differently, and that dissatisfaction can be traced by job title and duties. A survey of nearly 1,200 working journalists found that desk employees—that is, copy editors and page designers—have the lowest rate of job satisfaction, while sports journalists have the highest. Reporters and managers showed no significant differences in job satisfaction than other newsroom positions. Nearly all reported that they work differently, or that their job responsibilities had changed in recent years, because of digital disruption. Brock Ternes, lecturer in sociology, Laveda Peterlin, doctoral candidate in journalism, and Scott Reinardy, professor of journalism, all at KU, wrote the study after collaborating in an independent study, research-focused class. The article was published in the journal Journalism Practice. The survey measured job satisfaction via an established research instrument and included open-ended questions designed to gauge individuals' satisfaction with their work. "The survey allowed us to look at job satisfaction for a number of different workers in the newsroom," Ternes said. "The positions that were most concerned about quality, the desk job types, tended to be the least satisfied. One compared it to a manufacturing job, just an overwhelming amount of work." Desk workers regularly reported they had been given new duties, such as preparing content for the web, making social media posts, editing web pages, maintaining blogs and had also often had their staff cut. The resulting expectation of more work in less time with fewer resources contributed to the lower levels of job satisfaction, the authors said. "Those folks in desk and editing positions find themselves in a situation of not only burnout, but doing jobs they weren't originally prepared to do," Peterlin said. Conversely, sports writers reported much more job satisfaction—54.5 percent reporting "high satisfaction" to desk workers' 31.1 percent—despite reporting their jobs had changed as well. Managers and reporters surveyed showed high satisfaction in their jobs at 50.5 and 44.7 percent, respectively. Desk workers were tops in low satisfaction at 35.2 percent, while sports writers were the least often dissatisfied at 15.4 percent. The findings and responses to the open-ended question suggest changes because of digital disruption have fallen most heavily on desk workers and that they have not been able to adjust as well as their colleagues. 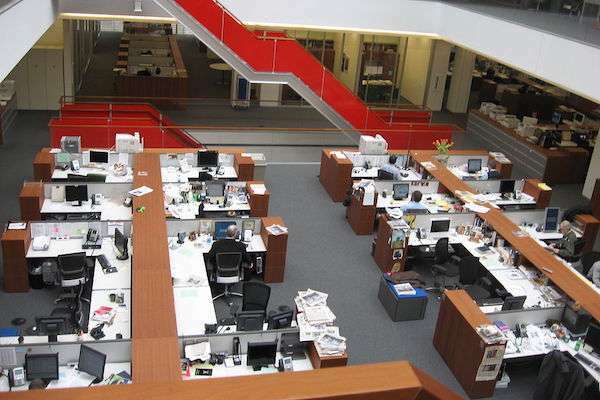 The findings also show the importance of autonomy in a newsroom employee's work, the authors said, as desk workers reported having the least autonomy among respondents. Editors and designers are frequently the last people to work with content before it is published, and in open-ended comments often said that the quality of their work is suffering, even though quality of work was not directly addressed in the survey. "Sometimes disruption has changed the definition of what they do," Reinardy said of desk workers. "They're not copy editors any more. They're doing a lot of things that weren't relevant or important 10 to 15 years ago. That responsibility lies heavily on them, and in the workload overall, which can diminish work value, self-esteem and those type of areas." Not only do the findings show that dissatisfaction can be predicted by job title and level of autonomy, they also demonstrate that during the upheaval in journalism, changes have been handled differently across varied positions. "The differences in satisfaction can conceivably be explained by the job demands for each position," the authors wrote. "While desk workers said job demands were a substantial part of their job changes, the more satisfied reporters and sports journalists described job demands as less burdensome… It is worth noting that nearly half (45 percent) of respondents still express high levels of job satisfaction during the industry's most transitional period; apparently, journalists still remain a steadfast workforce committed to their field."